Hand warmers offer instant heat on cold winter days. Just pop the metal disk and massage the gel pad as the gel begins to crystallise, instantly releasing heat. Keep them tucked inside your gloves or coat pockets for a very welcome warm-up on icy days! 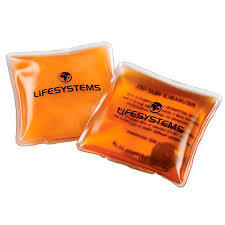 These pack of 2 hand warmers have the added benefit of being reusable. To 'reset' the crystallised pad to its original gel form, add the pads to a pan of boiling water and allow to simmer until the crystals have completely dissolved. Allow to cool totally before handling. Each activation lasts up to 90 minutes and can emit heat of up to 54 degrees celsius.